How to minimize your tempering line energy consumption? It is no surprise that energy efficiency discussions have widely spread to include glass tempering lines. After all, glass tempering can’t be considered a “green process”. How we look at energy consumption is not only about green values, the environment and government subsidies, it’s also about decreasing operating costs. The topic, however, is also maybe the most misunderstood one in the industry. Line manufacturers and processors talk constantly using the terms without fully comprehending what certain terms and numbers actually mean. We wanted to give you some insight into your real line energy consumption and how to minimize it. No matter if you are thinking of going into the business or are already running a tempering line, we believe this information will be helpful. In Part 1, I will concentrate on helping you understand where the energy is actually going. And Part 2 will include practical guidelines to minimize your energy consumption. Energy consumption is the amount of kWh you use to get a certain amount of glass processed. Note! The unit of energy consumption is kWh, not kW or kVA. Energy consumption should always be mentioned as the function of produced glass per area, and thus, the energy consumption unit should always be kWh/m2 (or ft2). Installed power, which has nothing to do with energy consumption, is the power of all electrical components calculated together. This figure alone does not mean anything. However, the heating power directly tells the tempering line’s ability to run at high-capacity production. When combined with information on how much of this power is used at different stages in the process, it can be used to dimension transformers. As a comparison, this is like looking closely only at the engine size when buying a car without looking at the fuel consumption figures. The average process power (APP) means the average power demand during one tempering cycle with a given product. The unit of APP is usually kVA or kW. APP always changes with the glass type and thickness. APP can be easily decreased – just run less glass. In other words, APP is always higher the more glass you run. So for instance, if you have a fast and efficient tempering line, your APP will be higher. Note! This does not apply to energy consumption (kWh). If you have a fast and efficient tempering line, the energy consumption per produced m2 will actually decrease. Now, let’s look more closely at the tempering line’s energy consumption. To understand which of these machine parts has a bigger impact, here is an example of one glass tempering line when it runs different glass types. Let’s look more in detail into each section of the line. As loading and unloading conveyors are peanuts in terms of overall line energy consumption, let’s concentrate on the furnace and the quench. The furnace section accounts for the biggest share of the total glass tempering line energy consumption. The most significant amount of energy actually goes to heating the glass. The nice thing is that heating the glass is constant. It cannot be affected, since it is determined by the nature of float glass as a material and the laws of physics. This means no matter what technology you have, the glass will always need the same amount of energy to be heated up. Heat loss through walls: some heat energy is released to the environment through the furnace walls. Heat loss due to convection compressed air: if compressed air is used as the convection method, the air that goes into the furnace also needs to come out. From an energy consumption point of view, this is lost energy. The energy needed to generate the convection, such as compressor power or motor power for circulated convection systems. The quench also forms a significant part of the total energy consumption in the tempering process. With thinner glasses, it actually accounts for approximately the same amount of total energy consumed as the heating. 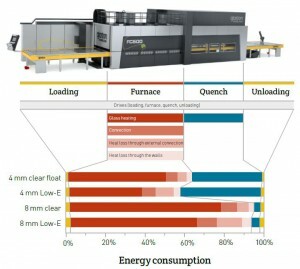 Loading efficiency: The bigger the loading efficiency, the lower the energy consumption. System used to run the blower motor (like inverters): Inverters allow the motor power to run down in between the heating cycles in an oscillating furnace. The more you can run the power down, the more energy you can save. Pressurized area in quenching: Sometimes thin glass is run with lower loading efficiency. The solution is to limit the pressurized area in the quench. Capacity of the furnace: The capacity of the furnace has a direct impact on the kWh/m2. The higher the line capacity, the lower the blower idling time and power. Even though blower motors have inverters, they still consume some energy in between the loads. In Part 1, I concentrated on defining the main sources of energy consumption. You hopefully can pick up some actionable points just by understanding the concepts correctly. In Part 2, I will include practical advice regarding the parts you should concentrate on when aiming to minimize your tempering line’s energy consumption. Stay tuned! Can you tell me, in a tempering electric furnace equiped with air recirculation, what is the overall efficiency. Energy efficiency depends on glass thickness and also type of glass produced. Energy consumption varies from 2.8kwh/m2 up to 8kwh/m2 with circulated air convection systems.